Community Action — Cara Mía Theatre Co.
geared towards community healing, learning, and strategies for action. Cara Mía Theatre programs a full evening of events by providing complimentary tickets to a culturally specific theatrical production, study guides, complimentary dinner, and in many cases will even secure subsidized bus transportation. The highlight of ‘Youth Nights’ programming is a carefully curated group discussion or activity prior to the play. Cara Mía’s Community Action Coordinator secures community leaders to lead thoughtful participatory discussions to foster a sense of community and strengthen cultural relations while providing a sense of ownership and strong social responsibility among the participants. Come for the conversation, stay for the show. Cara Mía recognizes the powerful effects of theatre as a vehicle to aid in the healing of trauma, building of bridges, and creation of thoughtful conversations. In order to increase transformative reactions to the theatrical offerings as well as provide actionable steps toward change, Cara Mía provides Community Conversations that accompany all productions throughout the season. Stay after the show to talk with the actors and local experts about the themes of the production. Learn more about the creation process and the real issues behind every show. Engage directly with burning artistic and social questions to discuss on the way home. Cara Mía Theatre brings the programming to you! Reacting to real-time national and local events, Cara Mía Theatre creates programming that travels to artistic ‘deserts’. In partnership with community centers, libraries, and storefronts, we bring free performances and forums to under-served communities. 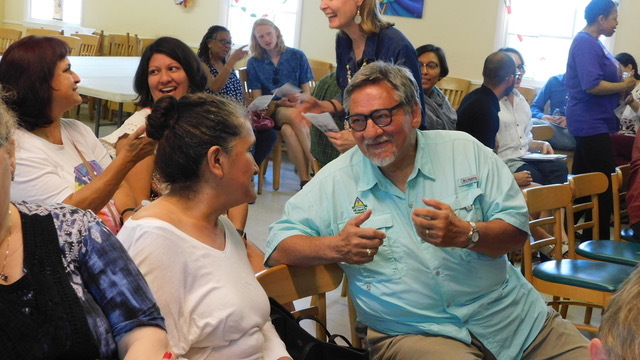 Community Conversations made possible in part by the Embrey Family Foundation and the Communities Foundation of Texas.